And in the New York Times? Mr Erdogan said the US had “repeatedly and consistently failed to understand and respect the Turkish people’s concerns”. Mr Erdogan said although the nations had been allies for decades, Turkey “now has alternatives”. He also condemned as “unacceptable, irrational and ultimately detrimental”, the sanctions imposed by the US on several Turkish cabinet members over the Brunson issue. What are the other issues of disagreement? There are quite a few, a number of them addressed by Mr Erdogan in the New York Times. He is clearly angry that the US has not taken more action against the Gulenist movement and what he said was a failure “to unequivocally condemn” the 2016 coup attempt. The US has refused to extradite Fethullah Gulen, who lives in Pennsylvania. US support for Kurdish rebel groups fighting Islamic State fighters in northern Syria. is another major difficulty, given Turkey’s battle against a Kurdish insurgency in its own country. On Friday Turkey made it clear Mr Erdogan had spoken on the phone with Russian President Vladimir Putin after the latest US tariffs, with the two men “expressing pleasure” that relations were progressing “positively”. It’s an awkward triangle, given that Turkey is a Nato member, Russia is Nato’s number one threat and the organisation is obliged to defend any member that is attacked. What were the latest US measures? 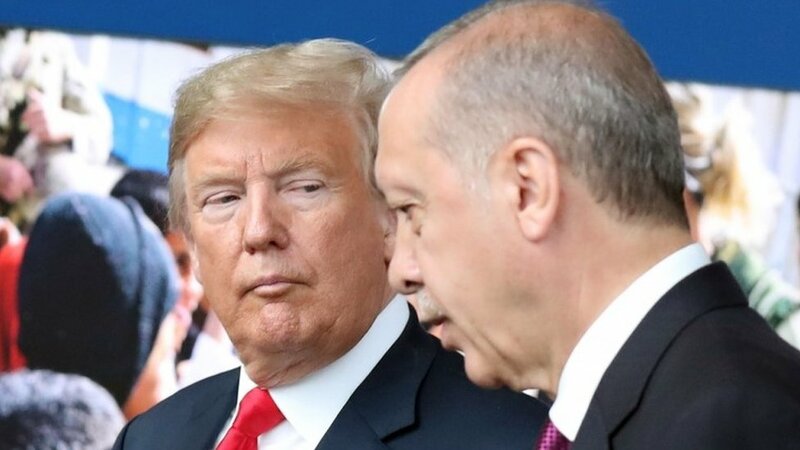 President Donald Trump doubled US tariffs on Turkish steel and aluminium, saying “US relations with Turkey are not good at this time”. The reaction from global currency markets caused the euro to slump to a 13-month low and pushed the dollar to a one-year high. American evangelicals have pressed Mr Trump for action on Pastor Brunson, who was held in prison for almost two years but was recently moved to house arrest. Turkey has also been hit by US sanctions on Iran, given that half of Turkey’s oil imports come from Iran.